The photo does not do this Prada-esque fabric justice. The colors are bright and vibrant and scream Prada Spring 2011 to me. This is 45" wide, silk ribbed faille with lycra for a little stretch (stable knit). Absolutely gorgeous; I was quoted $18/yd. Every fashion magazine on the newsstands now has a blue-and-white spread. This midweight poly/cotton print with big butterflies would make a great dress or skirt. Quoted $10/yd. For your stunning beach coverup. Armani cotton lace that looks like macramé. Quoted $25/yd. Hecht Sewing Machine & Motor Co., 304 W. 38th Street, NY. I love finding little glimpses into New York City's past: the wooden escalators at Macy's, our glorious main post office at Eighth and W. 33rd (technically not in the Garment District but close enough), and Hecht Sewing Machine & Motor Co. on W. 38th Street. I stuck my head in this emporium the other day and could have easily killed a few hours poking around the antiques here, many of which are related to the sewing industry. Unfortunately this lovely store is not open for retail traffic, but I don't think owner Steven Hecht minds the occasional visits from home sewists who just want to ogle items from their hobby's past. See more photos and read more in-depth articles about Hecht here and here. Don't you just love this vintage wooden display case filled with sewing machine feet? Hecht regularly supplies props to the Smithsonian and the TV and film industry. Whenever I have a rare chance to talk with fabric store owners, this is what I hear: The price of fabric is going up. And up. For a better researched perspective, read Trouser Math: Cotton Inflation Means More Skinny Jeans in this week's New York Magazine. 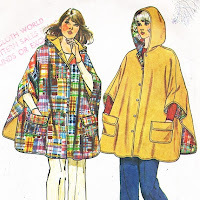 And while I'm personally not a proponent of building a fabric stash, now's the time to buy if you see fabric you like at a reasonable price…. Hours: Mon-Fri: 9:30 a.m. - 7 p.m.; Sat: 10 a.m. - 5 p.m.; Sun: 11 a.m. - 5 p.m. 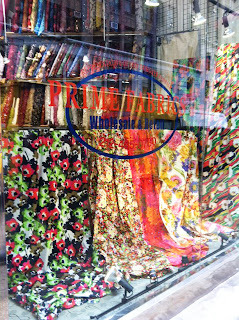 I made a quick drive-by visit to Prime Fabrics yesterday and scored a bright cotton print. I didn't intend to stop in this fabric store on W. 35th Street yesterday, but the retro cotton prints in the window caught my eye. I bought two yards of the fourth print from the left in the photo above, and am thinking I might cut out some of the big roses and sunflowers and appliqué a dress à la this Lilly Pulitzer dress. At any rate, what I thought of this Garment District fabric store: It's open on both Saturday and Sunday (points for that); it has a wide variety of fabrics, from laces to suitings to jersey knits; it has a big selection of ethnic prints; and it has a lot of junky fabrics. Don't venture into the far rear of the store unless you've called your mom and told her where you are; the precarious walls of bolts could fall on you and you might have to cut off your arm to escape. There was only one staff member in the store when I was there, and since he was assisting customers I didn't get to ask my usual questions. I get the feeling this is not a store where you're going to get any great deals. For example, my cotton print was $15 a yard, comparable to what Mood Fabrics would charge for it. 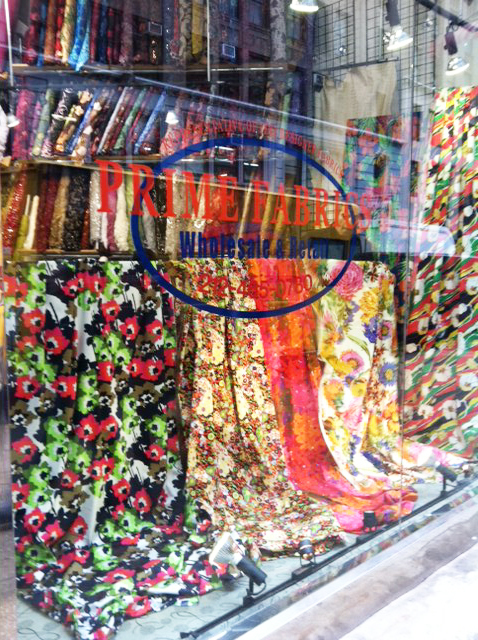 But if you're in NYC on a Sunday when most of the stores are closed, I'd definitely stop at Prime Fabrics. Lots of laces in all colors. 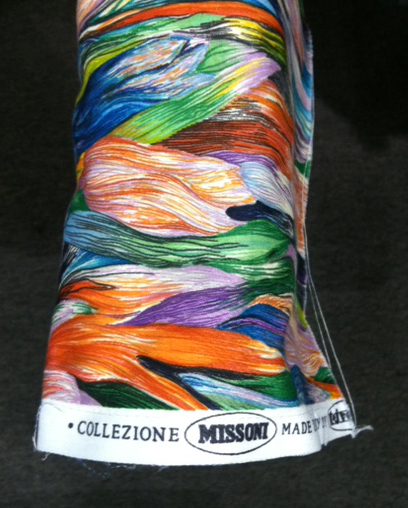 My designer label-seeking eye spotted this Missoni cotton print in the store. It wasn't exactly what I consider attractive, but hey, it's Missoni! Worth reading: Handbag designer Michelle Vale's plea to help New York "maintain its status as an essential production hub for designers." Read the full article here. 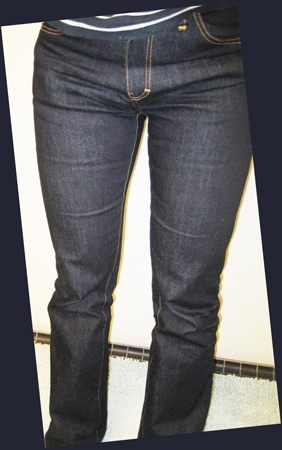 Carmen, a reader from New Jersey, sent this photo of jeans she made from denim purchased at A.K. Fabrics on W. 39th Street. Well done! 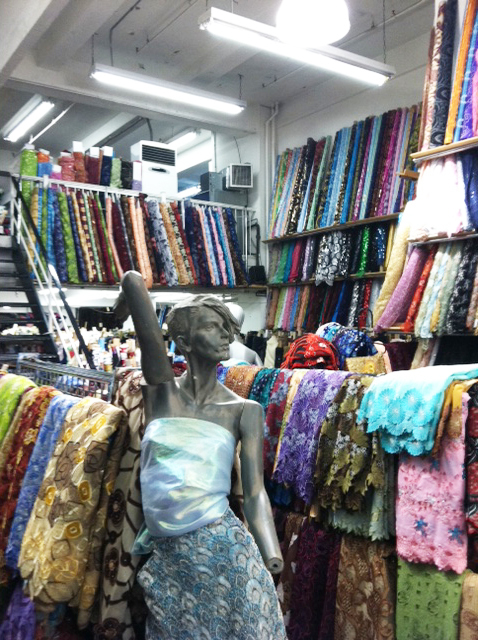 Do you have your own favorite fabric or trim stores or places in NYC's Garment District? Shopping advice or tips you'd like to share? Fond memories of shopping here in days gone by? I'm seeking fresh takes on the Garment District. If you'd like to write a brief post for Shop the Garment District or share photos, send me an email at lindsaytdesigns [at] gmail dot com and outline what you'd like to do. Looking forward to hearing from you! Do we mind stepping over bolts of fabric? Not when they're as fabulous as these are! I paid a well-timed visit yesterday to my friends Eugenia and Mathew at Elliott Berman Textiles yesterday, as their warehouse is positively overflowing with bolts and bolts of new fabric. Eugenia graciously took time from processing shipments to show me some of the splendid fabric Mathew acquired on recent trips. Many designer names were mentioned, including Chanel and Calvin Klein. I exercised great restraint and only walked away with two yards of a summery knit, while my friend Carolyn added seven yards to her burgeoning stash. I'd recommend heading over to EB soon, as many of these bolts are already earmarked for other fabric stores and online sellers. If you only need a small amount—like two yards or less—Mathew can usually part with that before he sends the bolt to its destination. And tell Eugenia and Mathew you are a reader of Shop the Garment District and that I sent you! Silk is one fiber that's easy to find in NYC's Garment District. Mood Fabrics, B&J Fabrics, NY Elegant Fabrics and Rosen & Chadick Fabrics all have decent selections of silks, including slubby shantungs. Prices will typically start in the $20/yard range and go up to $50/yard or more, depending on the weight of the fabric. However, on W. 39th Street you can usually find silk shantung and other silks for prices far lower than those at the bigger stores. These days I am loving the beautiful silk prints and solids at Chic Fabrics, including charmeuses by Tahari and Nanette Lepore that I believe are around $12.95 a yard. 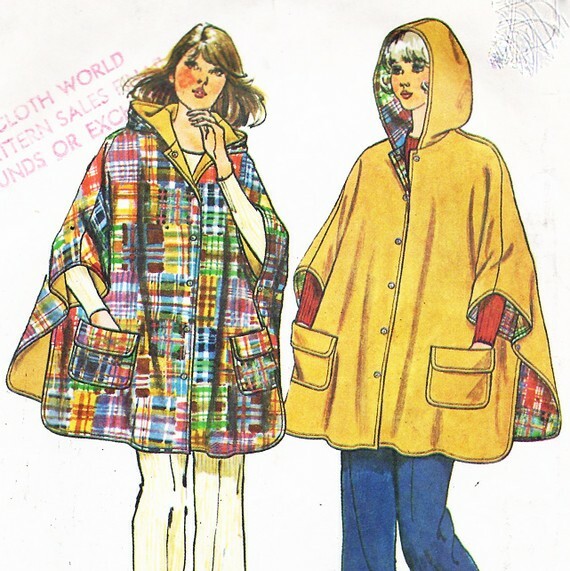 (If I can find the right blouse or tunic pattern I am definitely going back for a couple of yards of these.) Other stores on W. 39th carry silks as well, so you may want to start on W. 39th first—look for bargains—before you proceed to Mood and the others I mentioned.